China’s central bank is believed to be sitting on a fair chunk of Canadian change. While analysts don’t know for certain, they are making deductions from the latest International Monetary Fund report on reserve currencies held by central banks. That report, which tallied the holdings as they stood at the end of the second quarter, for the first time included part of China’s official reserves. And what it showed was a marked jump in the British pound and the Canadian and Australian dollars. When you put it all together, the addition of China appears to account for a good part of the change in overall holdings, in turn hinting at a “preference” for those three currencies, said Shaun Osborne, Bank of Nova Scotia’s chief foreign exchange strategist. This week’s quarterly IMF report, known as the currency composition of official foreign exchange reserves, or COFER, showed an almost 32-per-cent surge in allocations of the pound, to $312.8-billion (U.S.), or 4.7 per cent of the total. Overall holdings of Canadian dollars jumped by more than 13 per cent, to $127.7-billion or 1.9 per cent of the total. And those of the Australian dollar shot up almost 21 per cent, to $126.8-billion or 1.9 per cent. Those are “significant changes” for the three currencies in question, Mr. Osborne said. The U.S. dollar is still by far the reserve currency of choice, followed by the euro, the pound and the yen. Which makes the Canadian dollar the fifth largest, with Australia’s currency trailing close behind. While there could of course be other reasons for all this, it’s a pretty safe bet that Beijing’s reporting played a key role, and it’s clear that the People’s Bank of China is sitting on billions of Canadian dollars, based on the jump and general allocation of total reserves. “The quarterly flows are harder to judge this time around as, for the first time ever, China is reporting the currency breakdown of ‘a representative portfolio on a partial basis,’ ” said Royal Bank of Canada senior currency strategist Elsa Lignos. 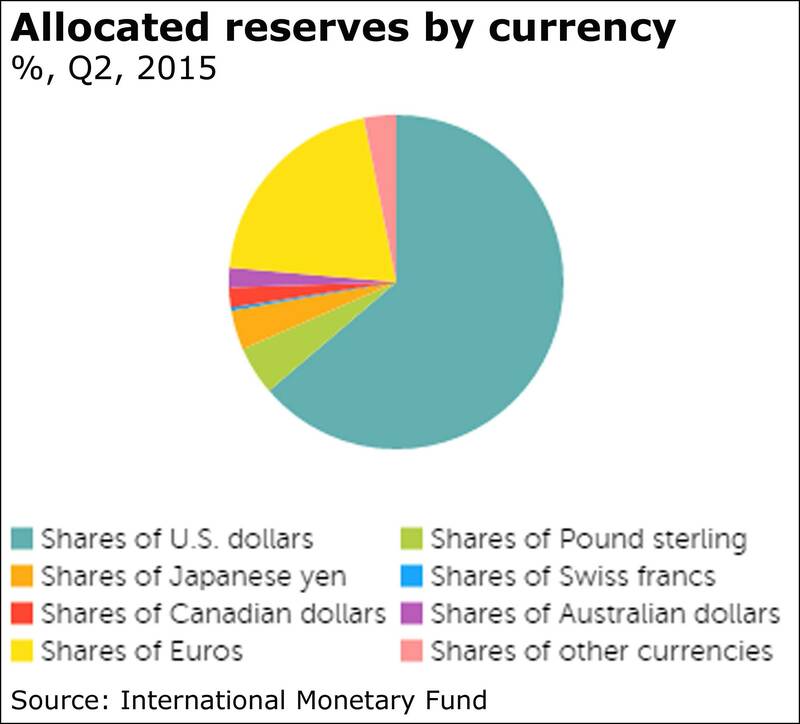 “That means a portion of China’s reserves which were previously all ‘unallocated’ (currency breakdown unknown) are now included in the allocated group,” she added, highlighting the increase in overall holdings of the pound, known among strategists by its symbol, GBP. Bipan Rai, director of foreign exchange and macro strategy at CIBC World Markets, estimated what the Chinese holdings look like based on previous data. The holdings of U.S. currency weren’t surprising, he said, but noted that China appears to have more pounds and Australian assets that other central banks, and less European and Japanese money than would be expected. Also “somewhat surprising” is that Canadian dollar holdings appear to be larger in China than the yen or the Swiss franc. Mr. Rai also addressed the question of whether there could be pressure on the pound and the Canadian and Australian dollars, given that China has been depleting its reserve because of a capital outflow. America’s labour market is showing signs of lagging, fuelilng speculation over when the U.S. central bank will begin hiking interest rates. The U.S. economy churned out just 142,000 jobs in September, well below what was expected, according to the Labor Department today. Not only that, but the government also revised down its August estimates, to show a gain of just 136,000 positions. The jobless rate remained the same, at 5.1 per cent. “If there was even a chance of an October move before today, that’s pretty much gone now,” said Andrew Grantham of CIBC World Markets, referring to when the Federal Reserve might hike its benchmark rate. Stocks slipped today in the wake of the U.S. jobs report. Tokyo’s Nikkei only inched up, while Hong Kong’s Hang Seng surged 3.2 per cent. Chinese markets were closed. In Europe, London’s FTSE 100, Germany’s DAX and the Paris CAC 40 sank, having been well up earlier in the morning. North American stocks also fell sharply.